As February comes to a close, we look forward to March. Yep, March: one of only two months that also happens to be a verb. Indeedy. The other? You’re telling me that you’ve never septembered anybody? You’ve been missing out, my friend. This is the kind of incisive, hard-hitting knowledge that makes you keep coming back week after week, right? Come to think of it: why do you come back week after week? Can’t you just leave me alone to mull my gadgets in peace? Fine, fine. As long as we’re on the subject, let me give you a quick overview of the technology we’ll be looking at this week: a time-traveling whiteboard, a media card reader that can help you decide what to wear, and one of the world’s most seminal gizmos. When my cousins moved into their new house several years ago, I remember being exceptionally jealous of one particular feature: a room in which several of the walls had been covered in whiteboard-like material. Since then, I have vowed that when I someday have my own abode, I too will have a whiteboard room—it’s kind of like the creative equivalent of a padded cell. In the meantime, I think that the TaskWatch whiteboard might adequately sate that hunger. From Art. Lebedev Studio, the same team that brought you the Optimus Maximus keyboard, comes this decidedly lower tech gadget: a whiteboard with an integrated analog clock. Simple? Yes, but genius. 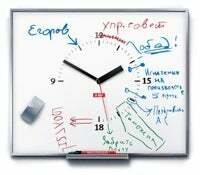 Having the clock allows you to make notes on the whiteboard of tasks related to particular times. Never forget that meeting at 11, or that conference call at 3, or—most importantly—5 o’clock, when it’s time to start drinking. And, despite what the picture above may suggest, I’m informed that the TaskWatch fully supports dozens of languages other than Russian. Productivity, of course, comes at a price, and like many of Art. Lebedev’s projects, you’ll certainly pay a premium over what it would cost you to buy a whiteboard, a clock, and some superglue. $200 is the price of the TaskWatch Model 02, which charts your work day from 9 in the morning to 6 at night. Model 01, which has the whole clock, will be available in March. But hey, at least you get a free eraser, marker, magnets, and cleaning solution too. Hot or not? Multifunctional USB Card Reader lets you know. 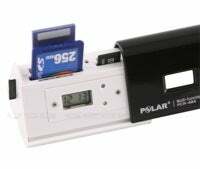 We’ve covered our fair share of bizarre convergence devices in our day, so here’s another one to throw on the list: the Multifunctional USB Card Reader. So often we spend time spelling out what these strange combination gadgets do, so let us instead tell you what the Multifunctional USB Card Reader does not do: it doesn’t steam broccoli; it doesn’t remove that built-up gunk from your car’s engine; it will not, under any circumstances, ensure that your cat is properly fed and groomed. I know, I know: you’re thinking “well, then, what’s the point?” Well, should you be in need of one hunk of plastic that can: a) tell you what time it is; b) tell you what temperature it is; and c) read memory cards, then you, sir/madam, may just be in luck. The Multifunctional USB Card Reader can do all of that and not a single jot more. It supports a truly astonishing array of memory card formats (remind me again why we need ten different types of digital media card? ), but you'd better like that ridiculous Celsius scale, because that’s the only temperature you’re going to get. Seriously? It can read SDHC, SD, MMC, and Memory Stick, but they couldn’t find room for Fahrenheit? For $15 you get your choice of black, white, or orange models with a “dustproofed triangular design.” Yes. It’s triangular. So, you see, the dust just slides down the sides. Totally. You’ve no doubt heard of the economic idea of the gold standard&mdash;especially if you've spent more than thirty seconds listening to presidential candidate Ron Paul. In the world of gadgets, however, we have a different standard: the “sliced bread standard.” It’s simple, really: in discussing a device, you need only determine whether or not it is indeed the best thing since sliced bread, that being the standard by which all other inventions must be judged. That would seem to suggest that the Robot Coupe bread slicer Tp180 is, in fact, the best gadget of all time. Feed it a baguette of French bread, and you will in short order be rewarded with a basket full of slices cut to your specified thickness. The stainless steel blades in the Tp180 cut anywhere from 8mm to 80mm slices, and can cut up to 360 slices of baguette per minute. That, my fellow Americans, is some serious sliceage. Of course, the ultimate gadget doesn’t come cheap. Intended for professional caterers, sandwich shops, and lunch vans (holy cow, can you imagine one of these things on wheels? ), the Tp180 will run you over $2,700. But think of how much money you’ll save by not slicing your own bread, hm? 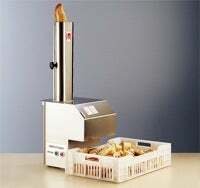 All this talk of bread-slicing has made me hungry—sadly, as work has not agreed to shell out for a Tp180, I will be devouring my baguettes in handful-sized chunks. The humanity. See you next week.